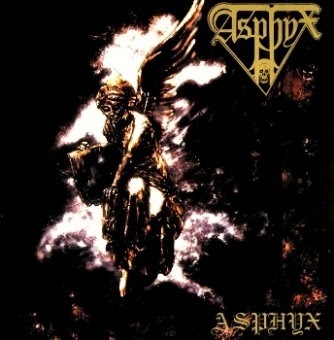 There are exactly three things I liked more about the eponymous 1994 Asphyx record than either of its predecessors, which I'll get into further on, but ultimately it's just too easy to forget amidst an era in which a lot of younger bands were creating more exciting, unique, volatile sounds and taking risks to further intensity death metal as a whole. Now, don't get me wrong, I'm a sucker for an old school album that 'gets it right' through tremendous riffing quality, atmosphere, production, and vocals with some charnel character to them, but Asphyx falls flat in two of those specific categories and its strengths do nothing to compensate. That this album was even possible two years after Last One on Earth, with 2/3rds of that core lineup gone (van Drunen and Bagchus) to other pursuits, is not lost upon me as a relatively impressive feat, but any 'magic' the Dutch trio might have garnered from their earlier momentum seems to have ground to a halt. The Century Media deal persisted, there was plenty of visibility and thus every chance to expand their following, but this music hardly seemed vital or inspired. The bass tones are appreciably repulsive, distorted and loud, especially during the faster and heavier sequences, but this was something they had already been ramping up with Last One on Earth, on which Ron van Pol had also played the bass, but he never really deviates from van Drunen's practice of aping the rhythm guitar line without contributing any depth beyond reinforcement (which is often just lazy). Of course, he's also providing the vocals as well, but here is where Asphyx suffers slightly, since van Pol's guttural Chris Reifert impression just doesn't have that manic, gruesome presence that van Drunen had already mastered in the 80s. This guy isn't a bad choice, per se, and thanks to the production he's able to build up a cavernous consistency over the riffs, but it's just one more reason this disc would never stand out against something like Demilich's Nespithe or the punctuation of Frank Mullen on the older Suffocation works. The new drummer, Sander van Hoof (aka Roel Sanders), could genuinely be considered an improvement over the performances on the older Asphyx outings, and it seems the trio was keeping with the times by hiring on a harder hitter, but apart from some double bass and energy this is just not in the same realm as where much death metal was headed by the mid-90s. Still, he's damn solid, and if you've heard his work with God Dethroned or Inhume then you'll know he remained that way. When you're going the route of the eponymous record, it's supposed to be a 'statement' of sorts, and the only one I received after revisiting this example was to put it back on the shelf (with most of my Asphyx stuff, unfortunately). There's a good balance of material, the band still splitting their creativity between the death and doom halves of Daniels' imagination, and I through the funereal touches like the organs (in "Back Into Eternity") or the 4-minute instrumental intro "Prelude of the Unhonoured Funeral" were some of the most atmospherically compelling over the hour-long run time, but this album just repeatedly confronts me with excessively plain and plebeian chord patterns that render tunes like the nearly 10 minute "Initiation into the Ossuary" almost unbearable; and that's one of the tunes that focuses heavily on Death and Obituary-like riffing almost exclusively! Other tunes, like "Thoughts of an Atheist", contain passages so mind numbingly bland that I thought I had accidentally replaced my daily multivitamin dose with a sedative. Overall, it's not the worst they could've done, due largely to the strength of the production, the decently scripted lyrics, and those nasty leads, but unless you're the sort whose standards translate into every death metal disc pre-1995 being TRUE and/or PERFECT, I can't imagine it's going to leave you with much more of an impression than it left me.